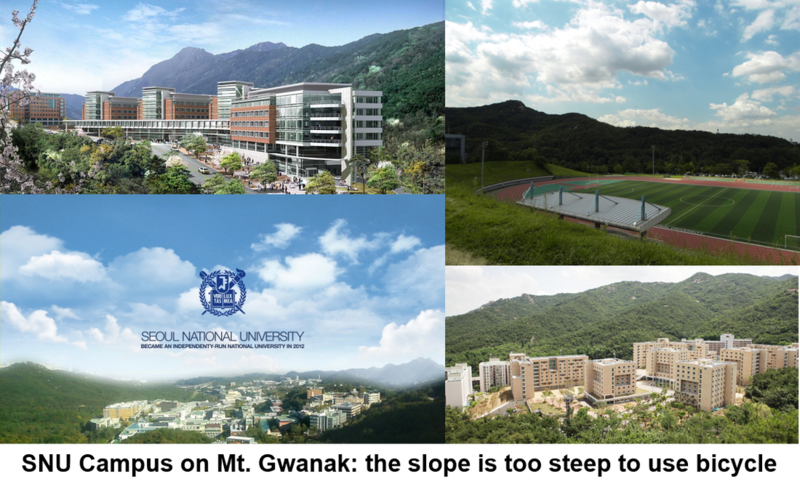 As part of the course project, I conducted a preliminary research to design a bicycle sharing system for Seoul National University (SNU) campus, which is located on Mt. Gwanak. Due to the slope all across the campus, people of SNU have seldom used the bicycle which is normally due to the slope all across the campus. To solve this problem, I designed a bike sharing and circulation plan in order to facilitate the use of public bicycles when moving downwards on the campus. Applying the principles of Geographical Information System (GIS), I quantified geographical information of the campus, divided the campus into several sectors, and determined the optimal position of bicycle racks considering the distribution of course-taking population. Next, I modeled personal demand for the bike use on campus mathematically taking several factors into account such as altitude of the area and distance from the nearest bus depot. Then, I optimized the number of bicycles for each sector and the circulation frequency based on the mathematical modeling and Benefit-Cost (BC) Analysis.